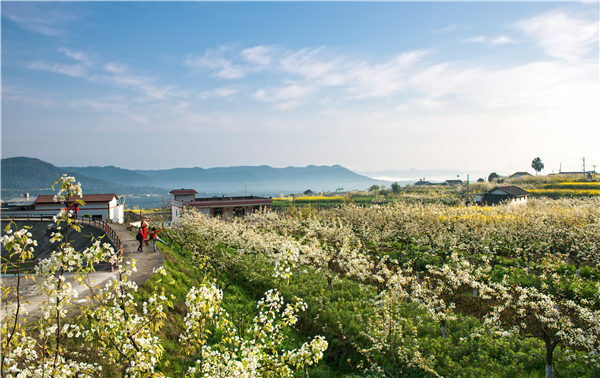 White pear blossoms crawl all over the mountains in Sichuan province's Cangxi county in early March. And they add charm to the already polychromatic landscape featuring golden rapeseed flowers, green wheat and florid peach blossoms. Many visitors travel to Cangxi to feast their eyes on the natural beauty that usually kicks off the spring travel wave. Since 2003, the local government has hosted 15 pear blossom festivals in March, where distinctive local folk culture shows, gourmet food events, and runs in the wilderness have been held. The pear blossoms cover some 10,000 hectares this year. And, local paper-cutout art and fishing festivals have also been held to enliven the visitor experience. The idea is to show the public that every site in Cangxi can be a sight, the local tourism authority says. The county in Southwest China has relied on its rich agriculture and forest resources to boost rural tourism over the years, and this has given locals new sources of income. The county is also striving to develop 18 modern agriculture parks that integrate farming, tourism and rural culture. For now, tourists can enjoy a dragon dance - that was designated a provincial intangible cultural heritage in 2009 - at the county's Jinlan park. The dance is typically accompanied by fireworks and a gong and drum performance. Also, they can experience health-boosting activities at Sanhui park and folk songs at Liuchi park. In 2014, Cangxi was named a national leisure agriculture and rural tourism model by the central government. "I didn't expect my hometown to see such changes. So no wonder my parents don't want to come and live with me in the city," says Zhang Hai, who was born and raised there. Since 2014, the local government has developed roads and large-scale special fruit plantations for red kiwi besides improved rural housing. Meanwhile, Cangxi is also tapping into its Chinese revolutionary history, stone carving and Taoism culture to add charm to its tourism push. To this end, the county introduced a total of 17 new tourism sites in 2018, and upgraded toilets and sign boards in major scenic spots, such as Gaochen Mountain and Yudai Valley. At the moment, several more comprehensive health tourism projects are underway. The purpose of developing tourism in the area is to increase local incomes, says a government official. The county's tourism routes featuring rural elements and the Jialing River received 7 million tourist visits last year, which brought income to the population along those routes, according to the local government. The setting up of national forest parks, water conservancy scenic areas and natural reserves has attracted nearly 30,000 local farmers to engage in farm tourism. Cangxi raked in 2.77 billion yuan ($410 million) in tourism income in 2018, accounting for 60.2 percent of the county's total revenue. And tourism has created more than 60,000 job opportunities and increased local per capita income by 2,000 yuan, the local government says. Zhao Yufang from Cangxi's Wenjiajiao village is one of the many beneficiaries of tourism. Wenjiajiao improved its infrastructure and built a kiwi garden and some rural parks in 2013. And Zhao rode the wave of local tourism development and started up her own agri-tainment business. Zhao says now her annual income is around 150,000 yuan. The Cangxi government has also invited experts to give tourism service training to locals. And it has helped to develop rural homestays and leisure farms to cater to tourists' requirements. E-commerce is also being used to introduce local farm products to outsiders. Now, tourists do not have to pick fruits on their own, but can buy more than 60 local specialties online, including handmade silk rugs, pears and kiwi fruit. Annual e-commerce transactions were worth more than 300 million yuan last year, according to the local government. "Cangxi is at the tipping point when it comes to getting out of the poverty trap," the county's Party secretary Zhang Shouyu tells China Tourism News. The government will continue to enhance its industries, including rural tourism, to turn the "pear village" into an economic corridor, says Zhang.